US east coast communities face "epic amounts of rainfall" from storm Florence, which has been linked to at least 12 deaths. It has caused catastrophic flooding since arriving as a category one hurricane on Friday. Some towns have already seen 2ft (60cm) of rain in two days, with totals forecast to top 3.5ft (1m) in places. It is feared that more communities could become deluged as the storm crawls west at only 2mph (3km/h). "This system is unloading epic amounts of rainfall, in some places measured in feet and not inches," North Carolina Governor Roy Cooper said on Saturday. He urged against residents attempting to return home, warning that "all roads in the state are at risk of floods". US President Donald Trump has declared a disaster in eight counties in North Carolina - a move that will help free up federal funding for recovery efforts. The president may travel to the region next week, the White House says. US media say 12 people have died as a result of the storm. In South Carolina, a 62-year-old woman died when her car hit a tree that had fallen across a road in the town of Union. 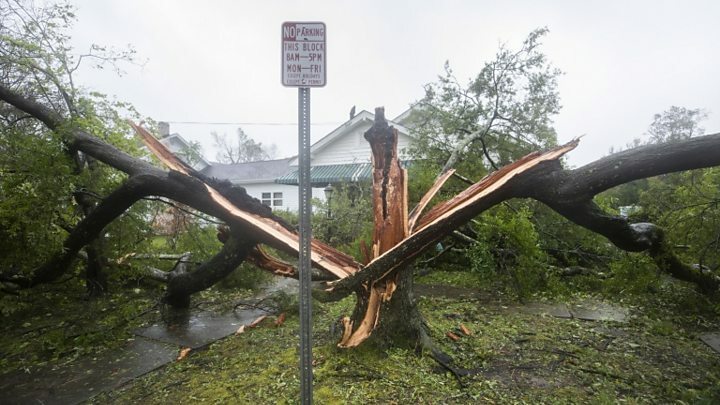 The storm is still leaving a path of destruction across the two states, despite its top sustained wind speeds weakening to 45mph. About a million customers in the two states are without power, the New York Times reports. A spokesman for the South Carolina Highway Patrol warned on Saturday that conditions remained treacherous on roads. "You know the areas that don't have power, it's hard to see the power lines in the road way," said Trooper Bob Bers. In Fayetteville in North Carolina, officials warned people living by swollen rivers that the worst was yet to come. "If you are refusing to leave during this mandatory evacuation, you need to do things like notify your legal next of kin because the loss of life is very, very possible," Mayor Mitch Colvin said. Colleen Roberts, city public information officer for the area, told BBC World News more than 4,000 homes had been "destroyed or completely damaged" there, based on calls they had received for emergency services. "That's preliminary at this point. And we have 300 businesses that are damaged or destroyed." Where is the storm heading now? The centre of the storm moved slowly westward on Saturday across the Carolinas, bringing further heavy rain and flooding, the NHC says. It is weakening as it moves inland, heading northwards through the Ohio valley by Monday. 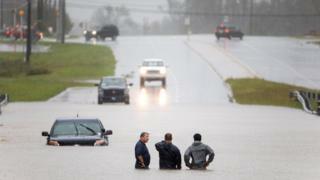 The Federal Emergency Management Authority (Fema) has said motorists should not attempt to drive through floodwaters. "Just turn around and don't drown," officials said. Video Why do people ignore hurricane warnings?